At Aus-Tex Transmission, you’ll find friendly, knowledgeable staff and Diesel Certified technicians ready to help you with all of your diesel service and diesel repairs in Austin, TX! Two of our talented auto mechanics hold Diesel L2 Certifications and are ASE Certified Master Technicians, experienced in performing all types of diesel maintenance services and repairs. We are fans of diesel engines and upgrades just like you are. A diesel upgrade is a beautiful thing! We understand the upgrades you want for your toy, tow rig, or veggie car, and are able to offer reliable diesel repairs and diesel performance enhancements to get your vehicle just the way you like. From exhaust services and air intake work, to software updates, torque upgrades and horsepower upgrades, we’ve got you covered. Aus-Tex Transmission is proud to be one of the few transmission shops in the area with Diesel Induction Cleaning Service for EGR equipped engines. Using the BG Diesel ISC® Induction System Cleaner™, even the most stubborn oil deposits and unburned fuel formed by EGR and PCV gases will be removed. BG Diesel ISC® liquefies deposits, allowing them to burn in the normal combustion process. Check out the video we made about removing the cab from an F250 or F350 Super Duty truck. 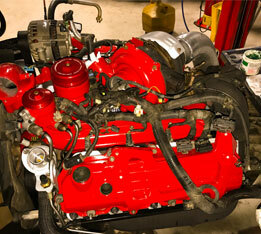 This allows us to get to the parts we need, to complete your diesel upgrade services. Our friendly Diesel Techniciand are always happy to answer any of your diesel repair or diesel service questions so you are comfortable with the automotive services we provide. We appreciate you making us your choice for all of your diesel repair services in Austin, TX. There are many reasons why the 6.0 Ford engine could have problems, most of which could have been prevented by proper maintenance and upgrading oil cooler system, which makes up for 80% of Ford 6.0 engine problems. Let our staff explain the different options that exist when repairing your diesel engine to keep it on the road for years to come!